By buying this product you can collect up to 24 loyalty points. Your cart will total 24 points that can be converted into a voucher of 0,72€. Ensuring the proper nutrition of physically active people becomes an increasingly challenging task for the manufacturers of dietary supplements. One of the reasons for this is the ever growing number of sport active people. As an increasing number of people are opting for a healthy and conscious diet there is increased difficulty when it comes to diagnosing food allergies or intolerances which may be associated with dairy products, such as whey protein fractions, which otherwise are a very valuable source of proteins. 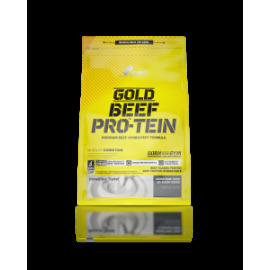 GOLD BEEF-PRO™ - TEIN is a response, from the Olimp Labs® specialists in food supplementation for active people, to the issue of the diversification of the sources of proteins in the dietary plans of physically active people who face the challenge of adding top quality bovine protein concentrates to their diets. 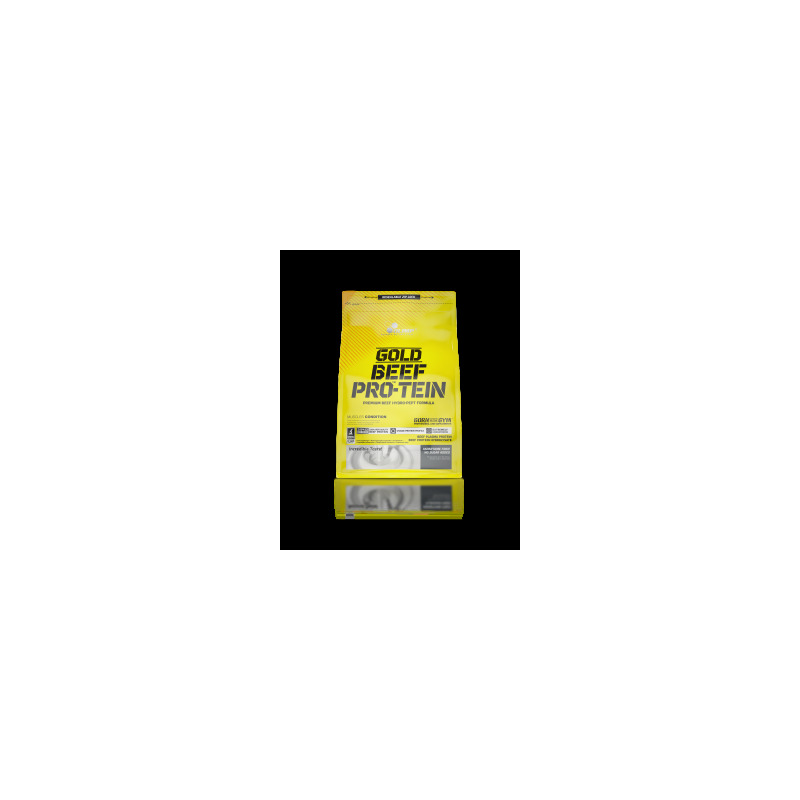 GOLD BEEF-PRO™ - TEIN far exceeds the effects of the single-component bovine protein hydrolysates, which are so popular on the market. This premium product, enriched with proteins and bioactive peptides from bovine blood plasma exhibiting a broad spectrum anti-inflammatory action which, according to the following article and cited references, may significantly contribute to increased growth, quality, regeneration rate of muscle mass as well as better variables and volume of training. Beef protein hydrolysate used in the production process in pharmaceutical conditions, owing to its prior enzymatic treatment, is a source of rapidly assimilable free amino acids and peptides of low molecular weight which are absorbed directly into the bloodstream within about 15 minutes of ingestion. 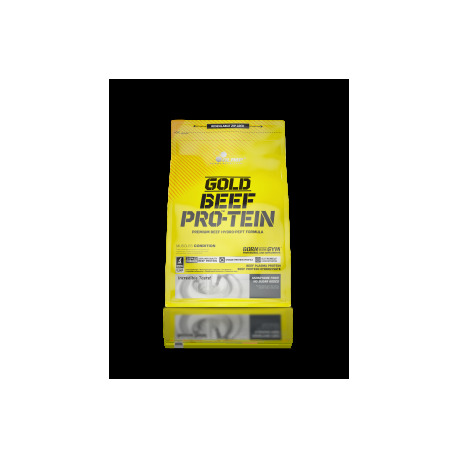 It considerably reduces the risk of catabolic states in muscle cells when they are under stress from exercise or during a period of temporary malnutrition. - it does not contain any contaminants which may accumulate in meat. - L-arginine (Arg). Although L-arginine is a relatively exogenous amino acid, its internal biosynthesis cannot compensate for insufficient supply with food in conditions of increased demand (i, ii) such as intense physical exercise or weakening of the body as a result of an accident or a disease. - L-proline (Pro) The most vital characteristic of Pro, from the point of view of bodybuilding and strength sports, is its capacity to regulate mTOR kinase activity (iv), integrating many important signalling pathways initiated under the influence of such important factors such as insulin or insulin-like growth factors (IGF I and IGF II; v, vi, ). Other studies (vii) show that increasing proline content in the diet by 2.1% results in an intensified body mass growth of up to 20% – from 342 to 411 g/day! The reason for such a significant change is increased nitrogen retention in the cells caused by Pro – from 1.27 to 1.53 g/kg of body mass. - alanine, used by the body as an alternative source of energy when it is experiencing low blood sugar (viii). Increasing its concentration in the blood may result in a lower level of involvement of other amino acids from the muscle tissue and, at the same time, reduce its catabolism in states of increased physical stress and energy requirements.